A Guide On Modern Workstations - Balancing Productivity and Comfort! Workplaces, nowadays, attach a lot of importance to redefining their spaces in a manner that suits and brings a balance between employees’ productivity and comfort. At the same time, aesthetics play an equally significant part. Given the number of hours time employees spend at the workplace, and keeping in mind the largely ‘open’ workplace layouts, it is essential to design workstations that are not just ergonomic, but are also flexible enough to be utilised across the floor, and to meet the need for expansion and improvements in technology. Here are a few ideas of how you can significantly influence happiness and productivity amongst the employees with the help of Modern Workstations. Workstations can no longer be restricted to individual desk-chair setups. Given the ‘collaborative’ environment in most workplaces, the need of the hour is for ‘open’ structures that foster communication. Modern workstations comprise of shared spaces where communication is easy and there is flexibility to engage in casual conversations. This prevents the unnecessary wastage of space as in the case of separate cubicles and also fosters collaboration. This design also facilitates an open atmosphere and moves away from a hierarchical mindset where all employees contribute equally and there is shared learning. While open workstations support fairness at all levels, care needs to be taken in other aspects. Desks should be clutter-free and devoid of paperwork. Using acoustic furniture helps to keep the sound levels in check, which would inevitably be a problem in such a design. Caution needs to be exercised while picking chairs for your employees’ optimum comfort. Since employees spend a lot of time sitting, it is important to have chairs and desks which are ergonomically designed. You can opt for saddle chairs, often equipped with a five-legged base, casters, and a pneumatic cylinder for adjusting the seat height. The design of a saddle chair allows the spine to maintain its natural 'S' curve and also improves posture. Saddle chairs are available in various colours and designs, thereby making them adaptable to the overall decor of the workplace. Similarly, motion stools are also designed to allow motion in every direction, as they come equipped with a weighted convex base with a treaded rubber covering that allow that maximises friction with the floor. Adaptable Desk Systems are well suited to an open and flexible layout. Not only do they provide the required flexibility, but they also allow easy technology integration, and can be extremely useful in the event of an expansion. They can be used to accommodate staff changes across the floor without any glitches. Similar to these systems, are the sit-stand workstations which can be adjusted as per the employee's preference. These ensure that the employees are not sitting all day, and are more productive. They not only shed few extra calories but also feel active & energetic. Keeping in mind the layout of your office, decide upon the furniture like desks and chairs. Depending on the size of the office space, figure out which desks suit your office, whether there is enough space to open drawers and cabinets. You can also utilise unused corners by opting for unconventional furniture like beanbags. If you have big space available, you can play with a variety of options. Reserve some space for long tables which can accommodate five to six employees. With the rest of the space, you can give your office a relaxed look with contemporary furniture. If the majority of the employees work with movable laptops, these designs work wonders and will give them the flexibility to work as per their comfort. Space can also be utilised for collaborative furniture like pod sofas (high back, compact sofas which can be used to create a more private space for meetings on the work floor), office booths (fully-equipped special booths designed to accommodate two-three persons), etc. Believe it or not, colours play a very vital role in influencing the psychology of people. Colours like grey and black exude a very sluggish feel. Incorporate vibrant colours like green, blue, yellow and red into your office décor. 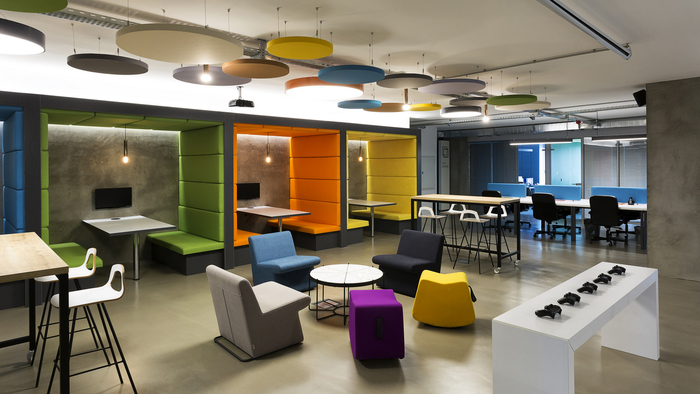 These colours help bring energy, focus and productivity amongst your employees. Green: The colour of Nature, it helps promote harmony, reduces anxiety & strain. Try incorporating the colour green with the help of some plants and make them a part of brainstorming spaces to inspire creativity. Blue: The most soothing colour, blue helps promote trust & communication and improves focus. It is great for detail-oriented work. Yellow: Yellow is a fun, engaging colour that helps stimulate optimism and encourage innovation. Red: This is a warm colour and is useful for places that require a lot of physical activity. Making use of natural light positively impacts an employee's productivity. The workstations can be arranged in a manner to make most of the natural light available. In the absence of natural light, a combination of overhead and ambient lighting can be used. For employees working late into the night, task lights can be provided on their desks. Apart from workstations, employees also need areas where they can relax and recharge. Let's look at some of the other aspects that can be incorporated to ensure productive and happy employees! Here are some of the other steps you can take to ensure that employees are happy and energized! It is very important to take adequate breaks during work hours which help employees feel rejuvenated. Having separate spaces like a cafeteria or a recreation area within the office premises goes a long way in ensuring that employees are relaxed. These spaces also serve employees who wish to connect socially and casually with each other. They can discuss the meeting that’s about to come up over a cup of coffee or just gain perspective on an upcoming project. This helps to release stress and also boosts employee morale. Having a library also helps them broaden their horizons. An open workplace sounds exciting unless it does not interfere with someone’s privacy. There might be a need for a separate space to discuss team issues. The best solution to this is to design separate spaces that help your employees carry out their meetings peacefully. Make sure to have multiple meeting rooms as different teams may need them at the same moment. This will help avoid confusion and wastage of time. Alternatively, you could use acoustic baffles (construction or device that mounts up on the ceiling, used to reduce the strength of airborne sound) to control the sound levels. These were some ideas you can choosing workstation designs. Remember, healthy employees, make for healthy businesses! Get Home & Office Interior Designing Cost Calculators Interior Design Tips, Guides to help you make Smart Choices for your Interiors & Decor & more without filling up your email inbox! Call one of our experts to design workstations to ensure that your employees are comfortable and productive! Newer PostAmazon vs Google: Exploring Their Radically Different Approaches To Workplace Design And How They Both Work! Older PostThe X factor Which Plays a Significant Role in Hiring - How Office Design Helps You With Hiring!